“Oh, I see! That’s how it works,” I thought to myself as I reread the instructions for my new, pop-up popsicle molds for the umpteenth time. Popsicle molds should be simple, and they are, but somehow I hadn’t been comprehending the instructions to put the sticks on top of the molds, once they’d been filled. It took a demonstration for me to realize. How these molds work is that, after you’ve filled them, you put the sticks on top and once they’re frozen, you push it upwards to eat. I like it a lot better than the wooden stick in the centre – I don’t like accidentally biting the stick. I just cringe thinking about it. My grandmother got them for me, the same day I got the ball whisk and also visited the public market for fresh fruit with the intention of making popsicles. When I was younger, I didn’t understand why popsicles were underlined in red by my spell checker (the auto-suggestion was for it to be capitalized) but now I know that it’s a trademarked word. Funny how this world works, eh? Most of that fruit was eaten as is. 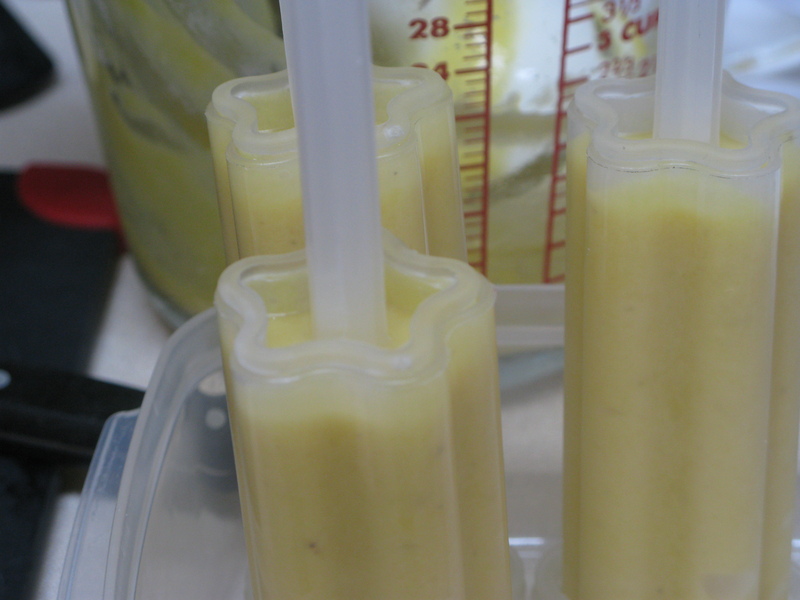 With making these popsicles, I also diced a mango for the first time, just for fun. Thanks, Nigella. Fun fact: mango skins can be eaten! They’re edible. Mangoes have always been peeled in my house and the skin is thrown away. I like the flesh right under the skin, after it’s been peeled, and after tasting the skin of the mango, I realize that what I’ve been tasting is residual from the skin. Eating the mango flesh and skin makes for a whole new eating experience, it adds another layer and dimension to the sweetness of a mango. Now I want to try a green mango, after reading an article about it in Saveur. It was a blighter to get the molds fitted back into the tray after I’d taken it apart to wash, so I just put the individual molds in a plastic container. Interestingly, as they froze, the sticks were pushed up a bit by the freezing liquid. I don’t know why that happened – I’m not that geeky of a food scientist to know that yet. My original idea was to photograph my siblings each holding a popsicle but it didn’t work out exactly as planned – mainly, bees and that the popsicles were melting, and that my sister and brother were being seriously tempted to eat what they were holding. Note that all the amounts are for guidance only – you can add more or less as you please. As is often with fun treats like popsicles and smoothies, the fruit is generally just thrown in and tweaked as you go along. For these, I would have used two mangoes for more more mango flavour but mangoes are usually just eaten as they are in my house – they’re rarely used in recipes, if at all – so I was left with only the one I’d saved. Either that, or I would have used less frozen banana. It would also make great smoothies, if you don’t have popsicle molds or can’t wait for it to freeze. There is no added sugar of any kind in this recipe; instead, the ultimate sweetness is determined by the fruit. Blend the frozen banana chunks and mango in a tall container using a hand-held electric blender until smooth. A food processor or blender may also be used for this. Pour or spoon into popsicle molds and insert sticks or, in the case of my pop-up molds, fill almost to the top and place the sticks on top. Freeze for up to 5 hours or overnight. For the pop-up molds, it’s not necessary to pull out the frozen treat from the mold: instead the stick is pushed upwards as the popsicle is eaten. Enjoy! Smoothie pops! Love them. I did not know that about mango skins, but will take a nibble next time I buy one. I really want to get some popsicle molds, do you know what brand those are that you have? They sound like good ones and I like that they are individually frozen. Yes, I liked that they’re individually frozen, too. The brand I have is Cuisipro. Here’s a link to the star pop-up molds on their site or on Amazon. Wow, love that first photo, Zoe! These look incredible! 🙂 And, you taught me a new word … blighter. LOL I’ll have to use that one soon. 😉 Thanks for the recipe, mold use instructions, and the tips! These look scrumptious. This is a must try!!!!! Don’t you need to add water or something to cut the thickness? These look really good! They were tasty! And in regards to cutting thickness, I didn’t think it was necessary but you may use a little water, if you want to. Cool popsicle molds! And these sound great. Hey Zoe – I made these today for the kiddies, and they loved them! I thought that I would definitely need to add some liquid. Nope! I can’t wait to try one tomorrow. Thanks! Sounds and looks amazing!!! So easy and nutritious. Yum. This recipe sounds like a great snack while lounging at the pool 🙂 Can I substitute fresh puréed apples for the mango? I love eating Kiwi skin too – it’s really tangy and the ‘hair’ isn’t an issue, you really have to try it to believe it. You said about the sticks being pushed up when they were freezing – it’s the same when you put in water in an ice cube tray – they always come out bigger. It’s something to do with the molecules restructuring themselves as it gets colder, but liquid generally does expand when frozen. Weird eh!